Akron, N.Y. – April 9, 2019 – Perry’s Ice Cream Company, Inc., a Great Lakes regional brand and Upstate New York’s #1 ice cream choice, has announced the launch of its first dairy-free, oat milk-based frozen dessert. 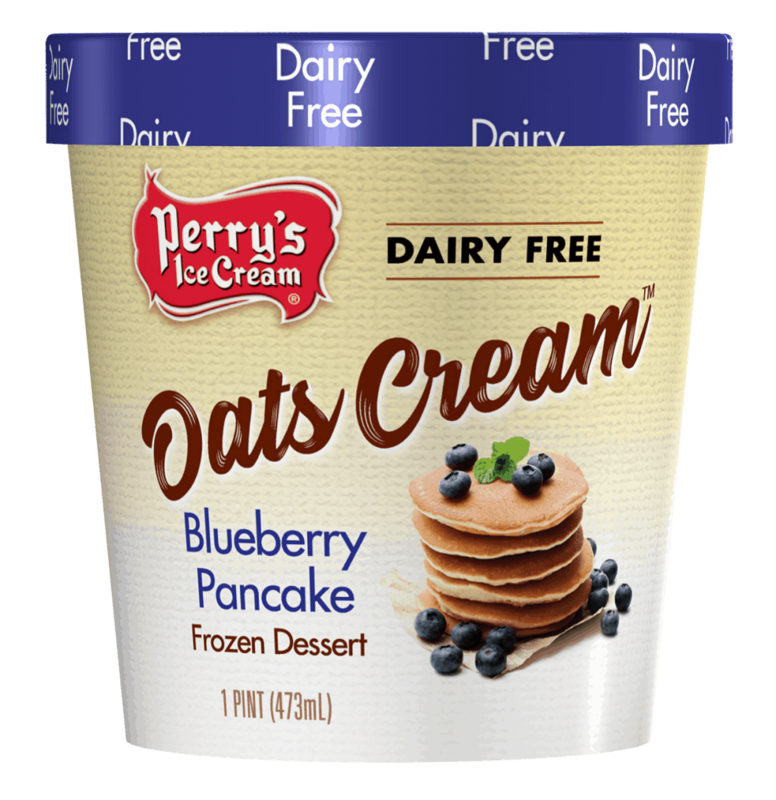 Perry’s Oats Cream™ line features seven decadent flavors available in pints: Apple Strudel, Blueberry Pancake, Coconut Caramel, Oat Latte, Peanut Butter Coffee Cake, Peanut Butter & Cookies and Snickerdoodle. The lineup is vegan, non-dairy, lactose-free, a good source of fiber, and made with whole grains. “I’m extremely proud of our talented team of research and development experts who have spent a significant amount of time crafting Oats Cream™ and the extraordinary results speak for themselves! The creamy texture of the oat milk and mild oat flavor means taste and consistency are not compromised for the dairy-free product. The indulgent flavors are truly delicious, and we’re excited to serve a wider population that may not have always been able to enjoy our products in the past,” said Robert Denning, president and CEO. Perry’s has partnered with Elmhurst® 1925 to provide the Milked Oats™ used to produce Oats Cream™. Elmhurst is based in Elma, New York, allowing Perry’s to continue utilizing local vendors to create quality products. Elmhurst 1925 makes simple, nutritious and incredibly delicious plant-based nut and grain milks – all with six ingredients or less. Perry’s Ice Cream, founded in 1918 by H. Morton Perry is a Great Lakes regional brand and Upstate New York’s #1 ice cream choice. Perry’s is a family-owned and operated fourth generation ice cream manufacturer. With over 375 employees, Perry’s uses fresh milk and cream from local farms to proudly craft and slow-cook its ice cream for an exceptionally creamy texture and taste that consumers have fallen in love with for over 100 years. For more information, visit PerrysIceCream.com. Elmhurst 1925 makes simple, nutritious and incredibly delicious plant-based nut and grain milks. Elmhurst was founded in 2017, but the company’s roots date back to 1925. Originally Elmhurst Dairy, the multigenerational, family-run organization operated for almost a century under Max Schwartz and son Henry. After a meeting with plant nutrition pioneer, Dr. Cheryl Mitchell, Henry made a progressive pivot and decided to close his famous dairy plant and found Elmhurst Milked. All Elmhurst plant milks are created through a unique HydroRelease™ method, which uses water to harnesses the full nutritional content of raw grains, nuts or seeds. Nutrients are separated and recombined naturally to form a smooth, creamy beverage without the use of added gums or stabilizers. All Elmhurst varieties are made with six ingredients or less and no added gums or emulsifiers. Its nut milks have up to four times as many nuts as other leading brands and its grain milks up to 20g whole grain per serving. Its Peanut Protein Shakes contain 20g protein per 12-oz. carton. To learn more about Elmhurst, please visit www.elmhurst1925.com, or find us on Facebook and Instagram.